If you didn’t already know, cats have one of the best poker faces out of any animal. While it’s generally easy to tell what emotions are running through a dog’s head, cats are frustratingly more difficult to decipher. In fact, a cat can be in total pain or be seriously sick, and if you’re not paying close attention, you might be none the wiser. That’s why it’s important to look out for the warning signs that your cat might be under the weather. While we’re happy to care for injured and sick animals at West Ballantyne Animal Hospital in Charlotte, the ideal situation is that your cats don’t reach the point where they need to come in in the first place. We all know how much cats like to sleep. So much, in fact, that it can be hard to tell when they’re sleeping more than usual. Since cats tend to take naps throughout the day instead of one long sleep through the night like we do, sometimes it can be tricky to deduce if they’re straying from their routine. But with enough observation, you’ll be able to tell. It should be no surprise that cats like to sleep more when they’re in pain. After all, that’s exactly what humans do. Cats are creatures of strict routine, so if they’re changing that up, it might be cause for concern. If your cat isn’t going to give you any information, you might as well get it from wherever you can, and that includes their droppings. If you’re a cat owner, you probably know what healthy cat stool looks like — solid and cylindrical. Diarrhea is a sign that something funky is happening inside their body, while blood and mucus are even worse. Additionally, you might want to check whether they’re peeing or not. Being unable to pass urine is a common problem when cats have an affliction. And one last thing — just like with sleeping, keep track of how often your cat is going to the litter box. If they’re going more than usual, it’s a red flag. Cats like to vomit. Some cats more than others, of course, but vomiting is much more of a pastime for cats than it is for humans. Cats are like high-end racecars — incredibly effective, but they require elite premium fuel to operate efficiently. The smallest things, like eating some disagreeable food, sets their stomach off causing them to vomit. There are also hairballs, which are a “natural” form of hurling. So, if your cat vomits once or twice a week, it’s probably nothing too serious. However, if your cat has been throwing up all over the place, it’s cause for concern. 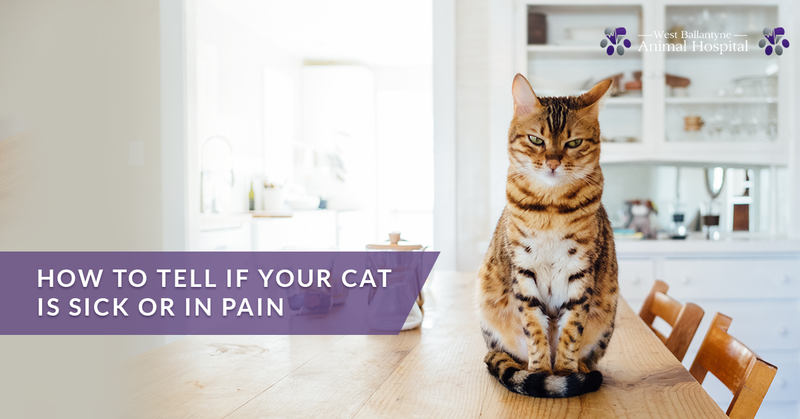 It means that your cat’s body is continually rejecting whatever comes inside of it, and we can’t think of a reason where that’s ever a good thing. If they’re vomiting a lot in conjunction with some of the other symptoms on this list, there’s a pretty high likelihood that something is wrong with your cat. When in doubt, it’s never a bad idea to take your cat to your local vet clinic. Our vet office in Charlotte is happy to help any animal, even if it’s just for a routine checkup. We want to make sure your cat is as happy and healthy as can be, and if there’s something wrong with them, you can bet that our trained, certified veterinarians will be able to get to the bottom of it. Stop by, or contact us today!